How to change the tolerance used for numbering? In Advance Steel you can set a tolerance value under which almost identical parts are considered as identical. 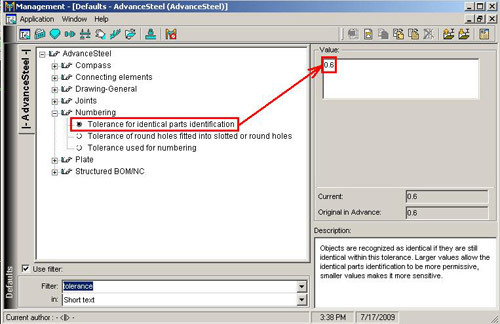 This default is called: "Tolerance for identical parts identification" and can be found in Management Tool > Defaults > Numbering. Differences in beam length. If the difference between two beams is smaller or equal to the default value, then the two beams will get the same part mark. Difference in width / length for a plate. You can have both width and length difference between two plates, but both values should be smaller or equal to the "Tolerance for identical parts identification" value. This default is not considered for plate thickness.